Ford is unleashing SYNC 3 in its vehicles starting with the 2016 Ford Escape and Fiesta, leaving the pain of the old version behind. The new generation of SYNC features a fast, clean touchscreen interface with new app integrations. Users of SYNC 3 will enjoy an integrated experience totally redesigned from a clean slate, hardware that uses faster processors, has better looking graphics, and features a capacitive touchscreen where a user can swipe, pinch and tap – much like operating a smartphone. After its makeover, the SYNC 3 communication and entertainment system became faster, simpler, and more responsive. As Ford’s connectivity system evolves with subsequent releases, updates can now be done over a trusted Wi-Fi network of the owner’s choosing. Technology has become personal in the form of smartphones, tablets, and wearable tech. Consumers want instant access and connectivity everywhere they go, and this includes our climate controlled, personal transportation system that we commonly call a car. Expectations are high and car shoppers are looking for in-car tech that is responsive, easy to use, and has an attractive look. In 2007, Ford introduced SYNC to its vehicles – a system that showed off a new way of connecting mobile phones and music devices. 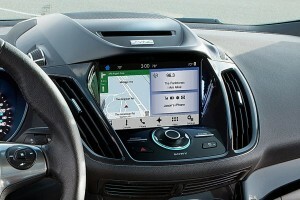 The technology let drivers use voice commands to place calls, request music by name, search for points of interest, etc. The idea was to make almost every function of the infotainment system accessible without having to take the hands off the steering wheel or divert your eyes off the road. SYNC was also integrated with car’s navigation system and had the ability input destinations using voice commands. In 2010, MyFord Touch, which was built on top of SYNC, integrated touchscreen capabilities. In 2012, a major update was released that greatly expanded the voice command vocabulary of SYNC. SYNC and MyFord Touch was a great idea, but it was slow, buggy and prone to crashes. Regular updates from Ford were released to address the bugs and weaknesses inherent with system. The challenge was getting Ford owners to update their SYNC systems. Updating the software is a manual process that involves downloading the updated version, copying to a USB thumb drive, and then walking that USB drive to the car to initiate the software update procedure. A small, but inconvenient task that a lot of Ford owners ignored. Has Ford been able to overcome all the deficiencies and poor user experience that plagued the first generation SYNC? We used the new SYNC 3 system for a week in a 2016 Escape, and agree that Ford’s connectivity system is much improved. Instructing using voice commands can still be a frustrating experience, but everything else works a lot better now. For starters, the 8-inch capacitive touchscreen is bright and responsive to a light touch. Ford Engineers tested different coatings to minimize fingerprints and glare. Users still have to live with fingerprints and smudges, but a lot less than the older systems. The only in-car touchscreen that is more sensitive and less prone to fingerprints is Chevy’s, which began to roll out with the 2016 Volt. Ford Engineers knew the original SYNC and MyFord Touch systems had lots of room for improvement. Using information collected from focus group clinics, quality surveys, customer feedback, and studying existing infotainment systems on the market, SYNC developers vastly improved the user experience. The home screen now has fewer menu buttons and are arranged in a grid pattern, which simplifies the selection process. Size of the buttons on the screen were increased – giving a larger touch zone and making it easier to stab a menu selection when the car is moving. Additional buttons and access to other apps are found on the alternate screens with a simple swipe of the finger. Navigation maps, shown in perspective and plan views, have a familiar pinch to zoom and drag feature. Response is really quick when manipulating the map on screen. Zoomed in with perspective view, the system also shows 3D-rendered buildings. Entering destinations or addresses can either be done using voice commands or tapping in alphanumeric characters into the “one-box” search field. Character recognition intelligence pops up suggestions of either points-of-interest or addresses. Overall, the user experience is greatly improved and SYNC 3 is much quicker finding a destination for the nav-system to map out directions. Route guidance takes a split-screen approach, showing upcoming turns in detail. Voice Command Screen – Pushing the voice command button on the steering wheel brings up this helper screen, showing some of the commands you can give the system. If you want Siri to answer your questions, hold the ‘voice command’ button on the steering wheel for an extra couple of seconds and instructions are passed to a connected iPhone. At the 2016 Consumer Electronics Show (CES), Ford recently announced the addition of Android Auto to SYNC 3. Connect an Android Auto smartphone and access Google voice search, Google Maps, Google Play Music and more simply by using the steering wheel controls and touch screen. In North America, Ford is making Android Auto available on all 2017 vehicles equipped with SYNC 3 starting with the redesigned Ford Escape. Owners of 2016 vehicles that have SYNC 3 will be able to upgrade their connectivity systems later in the year. SYNC 3 also features AppLink smartphone integration. Applink enables users to connect their Apple iOS or Android devices, and seamlessly access their apps like Spotify, Pandora, and iHeartRadio. Third-party apps installed on a connected smartphone are displayed visually with a tile on the Apps screen. iPhones must be physically connected to the system; Android devices only need to be paired with the system using Bluetooth wireless. Thus, smartphone apps can be accessed using the vehicle’s voice command system and integrated touchscreen, instead of fiddling with a smartphone in one hand and driving distracted. In this TFLcar video, Nathan gets a rundown of what makes SYNC 3 significantly better than the old SYNC and MyFord Touch system.